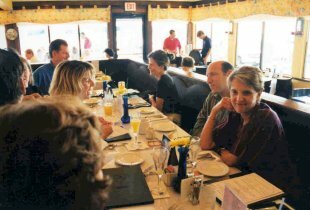 Our first visit was to Marblehead, Massachusetts and the restaurant The Landing. Marblehead Harbor is shown just east of The Barnacle restaurant. We all ate at The Landing on Sunday noon. 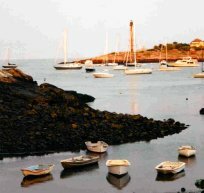 Marblehead, Massachusetts is north of Boston, about thirty minutes away from Logan Airport. It is along the coast, southeast of Salem. 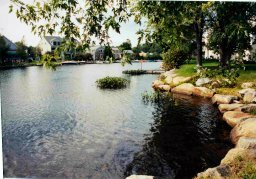 We next drove about two hours north to The Wolfeboro Inn in Wolfeboro, New Hampshire. Its rich history goes back to 1812. 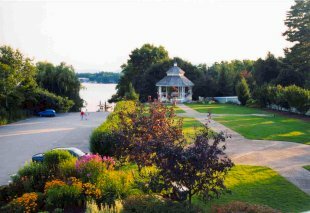 The beautiful flower gardens and gazebo at The Wolfeboro Inn are shown as they look out on Lake Winnipesaukee in east-central New Hamphire. 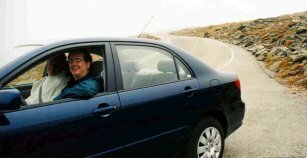 The photo at the top of this page shows Dan's lighted triangular-shaped patio above the drive-up to the inn's entrance. Tom and Ann join us out on the patio. Wolfe's Tavern, an authentic New England pub, is included within the inn with its row upon row of pewter beer mugs hanging from the beams. They are proud to serve seventy-five different brands of beer from around the world. 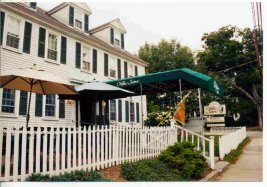 We ate at two restaurants, besides the already mentioned Wolfe's Tavern during our stay in Wolfeboro. The Wolfe Trap was closing for the season the night we ate there, and was a lively and interesting place to eat. Love's Quay can be seen in the photograph, in the left hand corner. We had a lovely view of the waters outside as we ate our delicious meal. 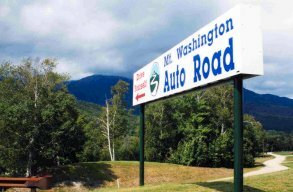 The sign points us in the direction to the scenic road that leads up to the top of Mount Washington. Dan and Tom are shown warming up the car for its journey up the mountain. Dan, why do you have a look of a car racer on your face? 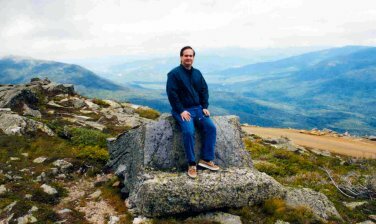 Dan is shown sitting on a boulder a thousand feet or so from the top of Mount Washington. We could see the clouds rolling in and by the time we reached the top, we couldn't see more than thirty feet in any direction. And Tom stands ready for the climb up the mountain. 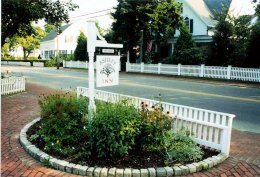 After four days, some of us drove on to Martha's Vineyard, specifically The Ashley Inn in the town of Edgartown.The living was easy at The Ashley Inn as we easily walked to downtown Edgartown and had afternoon tea and cookies (chocolate chip...mmmm!!) at 4 o'clock each afternoon.